Sambal Cuk – I Love It Spicy! 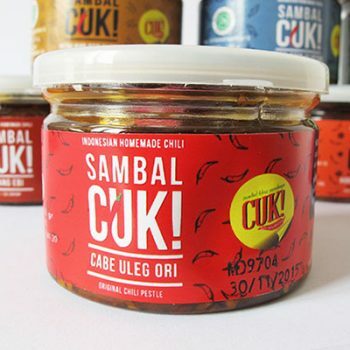 Sambal CUK – Chili Uleg Packaging – created using spices – spice blends naturally with the original recipe Surabaya. There are 10 different flavors that are ready to make your taste buds enjoy the spicy flavors you’ve never imagined before. Whatever side dish / dishes in front of you, when you colekkan to Sambal CUK, eat a plate would be felt less.